India is a land of colours, cultures, calmness and chaos all in a vibrant and delicate balance that you’ll find nowhere else. It is diverse and beautiful. It is huge and welcoming. But while it’s all these great things, it is also a little difficult. Buying a SIM card in India can get a little tricky sometimes especially if you are a roaming foreign traveler. You need many documents and there are many steps to obtaining one. Even when you have the cheapest SIM card in India or the most expensive one, it might not work with your phone unless your phone is locked and the GSM bandwidths are compatible. Types of SIM cards: There are two types of Indian SIM cards available namely; postpaid and prepaid or pay as you go SIM. A postpaid SIM Card is the one where you are billed after having used the services like calling, data, texting. Postpaid plans cost more than prepaid plans generally whereas a prepaid sim card in india for foreigners or a pay as you go sim india is where you pay before hand to avail services like calling, data, texting. The plans on this one are comparatively cheaper. Validity of a tourist SIM card is for max 90 days. After that it will automatically get disabled. If you are here for longer than 90 days you will have to rely on an Indian resident to get you a card. Or you will have to get a new SIM card for a foreigner with a new number. In most of the parts of the world, mobile phones are locked to their telecom carriers and only they (your telecom carrier) can unlock the phones for you. You will not be able to insert another sim or use it with another carrier unless unlocked. Home Address Proof and some more depending on your SIM card provider’s and seller’s requirement. Within 15 hours of your details being successfully verified, your SIM card to use in India should be active. Post that you can go back to the shop and top up or recharge your phone. You will have to make sure that you are in the same area as you bought the roaming SIM card for the activation to go through. For instance, if you bought the local SIM card in Delhi, you cannot complete the activation if you have travelled outside of Delhi. It has to be done within the same area it was issued. Indian government tried a scheme with free tourist BSNL SIM cards and international SIM cards being sold at airports. The free sim card in india for foreigners that BSNL used to provide, has now been discontinued. There is no such free sim card India that you can avail and we warn you to be careful from such fraudulent claims. As of October 2018, a new method of verification called ‘e-KYC’ was made available to foreign tourists trying to buy a sim card. The latest direction issued by the Department of Telecommunication, allows for fulfilment of E-KYC without a government issued Aadhaar (identity) number. This new provision, coupled with the term ‘E-KYC’ has led to some ambiguity. Taken at face value, ‘ eKYC’ suggests an electronic or digital method for submitting pertinent documents via the internet in order to fulfil the KYC requirements needed to buy a local sim card. The Entire process of eKYC verification will be undertaken by Licensees ( shops that sell sim cards) through authorised and official apps. e-KYC is done at Points of Sale or shops. Perhaps the most important omission in discussions about the new eKYC process is that a potential customer must be physically present at the Point of Sale ( PoS) or shop, where an Officially Valid Document for identification must be furnished. For example, an original and valid passport or a Driver’s License . At the Sim Card store, the merchant or shopkeeper Will take a live photo of the customer, that shall be embedded in a Client Acquisition Form ( C.A.F) by the storeowner. Further, this live photo of the customer shall be watermarked and must be geo tagged. i.e. include GPS coordinates along with time and date. These details are then embedded in the CAF by the shopkeeper, and sent to the regulatory telecom body for verification. Once a person’s KYC details are verified, that customer will be given access to an operating sim card. To avoid all this tedious process, there is another option you can opt for! Trabug offers a smartphone and a pocket wifi hotspot device powered by a 4G data connection. Both the devices are available to foreigners travelling to India on a rental basis. Trabug is designed by and for travellers. It is for anyone visiting India. Whether you are travelling for business, leisure or to meet family and friends, Trabug provides a hassle free experience of staying connected in a foreign country. You can rent a fully functional 4G sim card mobile phone in India at a rental price of per day which would be hassle free as you don’t have to buy a new use and throw phone and a separate SIM card and can avoid those costs completely. Why is the Trabug phone worth it? Your personal phone may not work while in India because the GSM band might not be not compatible or you might be locked to your home network. So, to have a working phone Indian cellphone, one may need to buy a new cell phone which would cost a few hundred dollars. Trabug saves you that big amount as it is a rental service and you pay a nominal amount only. The internet plans and international roaming plans too are amazing as while booking a cab or going through the social media apps (Facebook, Twitter, Instagram, YouTube, WhatsApp, Skype, IRCTC App, Google Maps, all come preinstalled), there’s hardly any lag. Most importantly, one can access the emergency information about police, hospitals, embassies, based on location anytime anywhere using your phone overseas. 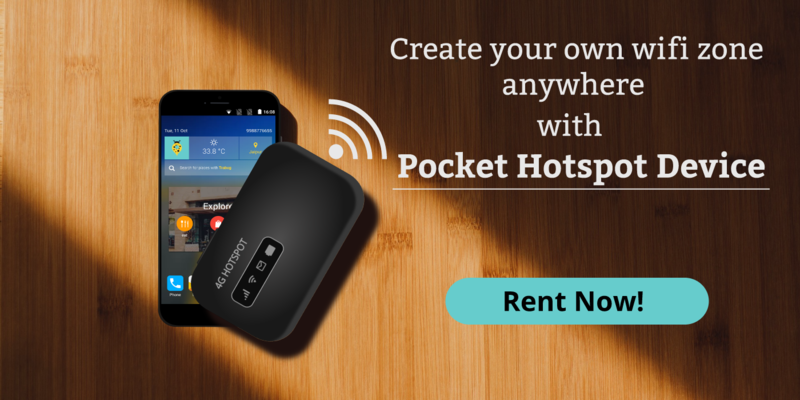 This is a small convenient pocket sized device to be used as a portable wifi device in India and that you can rent on per day basis. The device gives you access to high speed internet (4G) and hence provides data roaming services abroad. It is handy and lasts long. It can be charged again using a regular USB android cord. It comes with a companion app. Where to get portable wifi? It too is picked up and delivered at the doorstep. It comes with a high speed 4G connection which you can choose plans for. It lets you connect upto 10 devices at once and hence this is how the pocket wifi device works. The device lasts upto 6 hours after 1 full charge. The companion app is installed and you are good to go.